Time for an update about all things writing related as there's been a few interesting developments in the past couple of weeks. Definitely the biggest news is that I have a poetry collection contract with eLectio Publishing! I am awaiting the final details before its signed and sealed, but if all goes as planned, my collection of 80+ poems will be released in paperback and eBook on March 31st, 2015. I am very, very excited about the whole thing! I am especially happy about the potential to build on the momentum that Dirty Shirt has started. I've had a number of people tell me that they're not poetry fans but that they like my poems. I hope that plays out to those that follow me with this book. My poetry tends to be fairly concrete - nothing too flowery or sing songy here. The book will have as many as 10 themes each of which will have 5-8 poems. There are poems of love, and life, sadness and joy, houses and pets and many other topics. Many of them have a humorous element, but there are a lot of introspective pieces as well. There truly is something for everyone here and I hope people who like my work will give it a try. In my opinion it is a great follow-up to Dirty Shirt and with many of the topics based on the next book, it will tie in quite nicely. 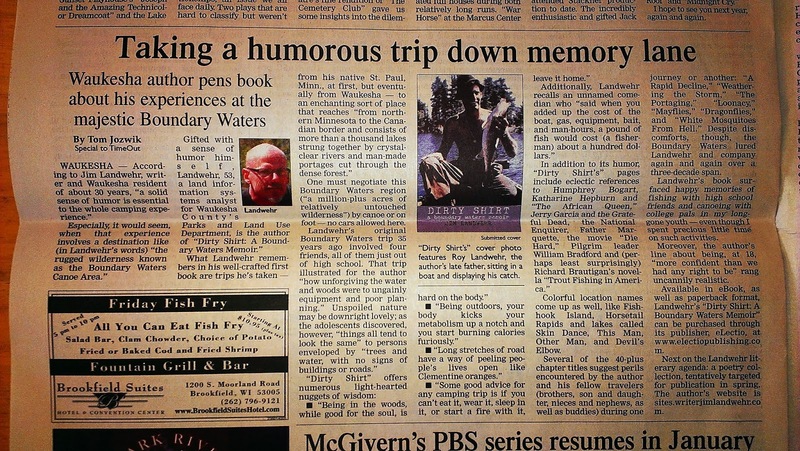 Another big recent development was my book review that came out in the Waukesha Freeman on New Years Eve. It was written by Tom Jozwik, a freelance writer for the Freeman and it really gives the book kudos. He quotes the book in many places and it was clear that he read and enjoyed the book. This professional review will hopefully allow me to get the book into the Waukesha Public Library. In an interesting side story, the reporter asked me if I was related to a Jack Landwehr who taught for a time in Indiana. Strangely enough that is my uncle. He was in the priesthood for a bit and taught high school in Indiana and actually taught Tom Jozwik. And when I showed the article to my brother in-law Mark, he said "I acted in a play with Tom a few years back!" So it is really a strange interwoven mess, but a cool one. Such a small world. On Friday I learned that one of my entries into a "Best Lists of 2014" contest took an honorable mention and will be posted on the Neutrons/Protons Magazine's website on Monday 1/5/2015. While this is not a huge deal, it was a lot of fun to put this list together. Mine list is the Top ten most annoying words or phrases of 2014. I solicited the help of my wife and daughter and we came up with a funny list. Check it out tomorrow. Wisconsin Outdoor Fun online magazine will be posting a Dirty Shirt blurb and excerpt in the next couple of weeks. If you follow me on Facebook or Twitter, I'll be posting links there. In the next couple of weeks I should be doing another radio interview with KFAN 100.3 FM in Minneapolis. These promotions all help and I'm getting more comfortable doing them every time. With all of that going on, I am still busy marketing Dirty Shirt when I have time, but even more exciting is I am now able to turn my efforts more seriously to the next book, which I am referring to as "The House Book" right now, for lack of a working title. I really want to get working on this, but like I said, I'm juggling a lot of bowling pins right now, so it's a balance. All good. I couldn't be happier right now. I have a feeling 2015 is going to be a great year too. Here's wishing you and yours health and love in the new year!